Customers 1st: Looking for New Ways to Revolutionize your Customer Experience? Looking for New Ways to Revolutionize your Customer Experience? Are you looking for the next must attend conference for customer-focused research and insights professionals? 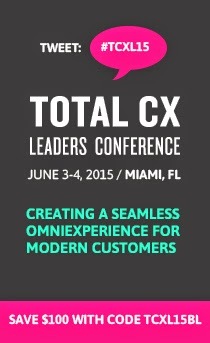 The Total Customer Experience Leaders Summit is an event you cannot afford to miss. It's the ONLY comprehensive forum for B2B and service oriented B2C leaders to come together for a high level exchange around the latest issues that matter most. This is an event about measuring feedback from your customers, operationalizing and optimizing it and making sure your program remains business relevant. Social Media & Traditional Research: What Are We Leaving on the Table? And those are just a sample of the 25+ sessions we have to offer. Download the brochure for the complete agenda. The Total Customer Experience Leaders Summit will enable you to effectively measure, align and communicate your customer strategy to ensure business relevance. Please use priority code TCEL11BLOG when registering. Register here. We look forward to seeing you this October in Phoenix!